The new Zacuto Z-cage takes a queue from the old Manfrotto Fig Rig and improves upon by leaps and bounds. The smaller diameter and hefty grips give it a sturdy feel. It leaves lots of room for additions to your DSLR rig. You can practically add just about everything need to the Z-Cage without compromising the maneuverability. This image below of a pimped out Z-rig should give you a fair idea as to just how many accessories can fit on it. A few weeks back I had the pleasure of working with the guy’s here at The Noob News at the Austin Comic Con. Christian asked me to do a series of short interviews with comic artists and writers at the show using a product he’d gotten from Zacuto, the Zacuto iPhone Point’n'Shoot. I love shooting on the Canon 5d. I love the professional film look it brings to any project, I love the ability to change lenses and shoot in any situation imaginable, and I love the community that has sprung up around it, sharing their wealth of information on a daily basis that allows anyone that picks this camera up the opportunity to shoot stunning video at the drop of a hat. There are however, a few drawbacks (as with every camera) that keep this from being the perfect weapon. I recently had the opportunity to shoot with the Zacuto Z-Finder Pro 3x optical viewfinder, a tool that goes a long way in making the already awesome Canon 5d even better to shoot on. When shooting video with the Canon 5d, one of the first things that you’ll notice is the lack of a large flip out LCD screen we’ve gotten used to in most HD cameras. This can make it difficult to accurately keep a critical focus on moving shots as well as just generally monitor takes on such a small screen. The Zacuto viewfinder does offer some help in solving a few of these monitoring issues. 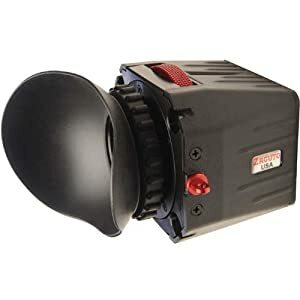 First off, what is the Zacuto Z-Finder Pro 3x? The Zacuto viewfinder is a simple attachment that snaps on the back of the Canon 5d allowing you to see a magnified version of the LCD view screen. The viewfinder with attached eyepiece allows you a better view of what you’re monitoring which comes in handy when shooting in bright sunlight. You no longer have to fight the glare to see what’s being displayed on the in camera’s built in viewfinder or re-watch your shot after every take to make sure you didn’t miss it because the viewfinder wasn’t bright enough or you were squinting and couldn’t see clearly. I found the eyepiece to be very helpful in keeping the sun out. During the pre-production phase of a recent viral video shoot, it was brought to my attention that I would once again have the opportunity to shoot on the Canon 5d. At first I was a bit hesitant, not because I don’t love the Canon 5d, but simply because the shoot would require a dynamic hand held look that is so popular these day and my prior experience had shown me that the Canon 5d can be quite challenging to work with in a hand held, free moving situation. This issue is brought about by the fact that the Canon 5d is a relative featherweight when compared to other full HD cameras on the market. It can be very difficult to shoot long hand held shots with this camera without suffering from shake and bump syndrome, especially when shooting off the end of the lens. That’s where the VariZoom ZG Rig DSLR, Zero Gravity Shoulder Support comes in.